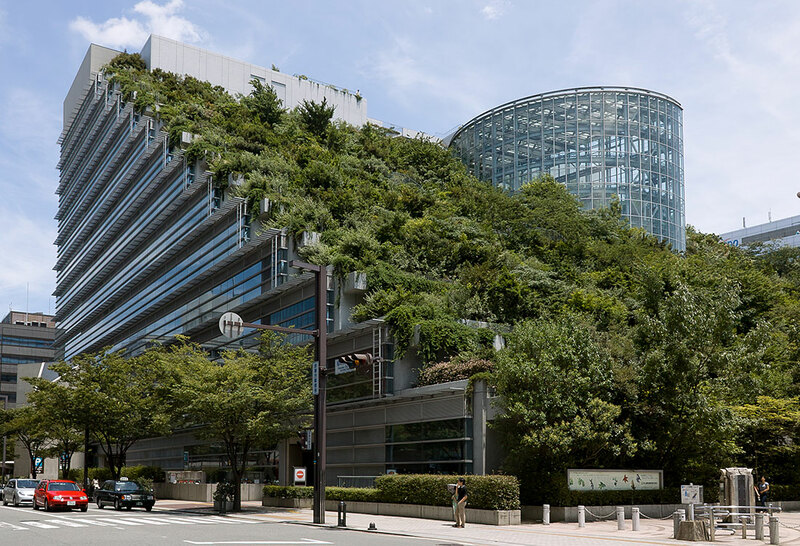 Green roofs on either building or parking garages provide a number of benefits including usable open space within densely developed urban cities. 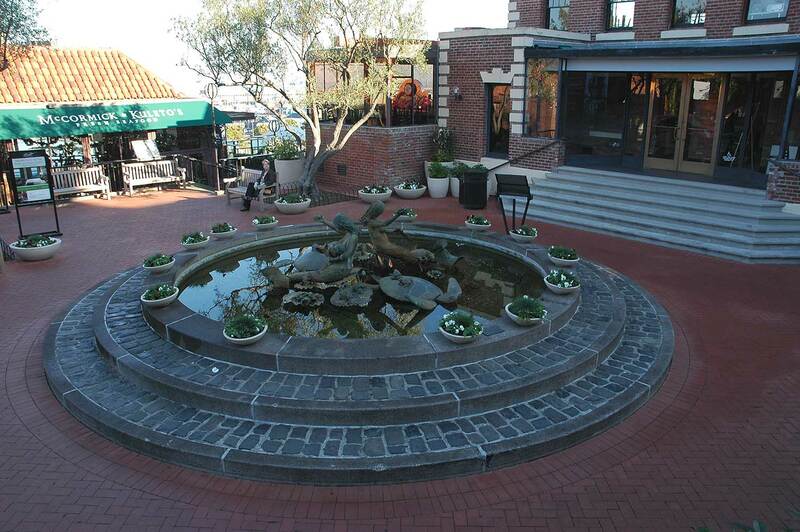 For example, Portsmouth plaza in Chinatown in San Francisco, shown in the image above, provides local children in an Asian neighborhood a place to play and a place for tourists to relax after shopping nearby. Many cities are adopting new ordinances requiring a minimum amount of green space for urban parcels that green roofs can satisfy. Tenants of apartment buildings can meet and hold functions on a roof garden while business building roof gardens give workers a place to relax and socialize near the work place. Pedestrians and shoppers flourish at Ghirardelli Square, an old chocolate factory that has been converted into a parking garage rooftop shopping center. Photo: Austin, 2011. Ghiradelli Square in San Francisco is another illustration of rooftop development that includes both social and economic advantages. This shopping district links buildings of several levels and provides retail goods and restaurants for residents and tourists. In addition, to direct economic use green roofs reduce heating and cooling costs and reduce the cost of treating stormwater runoff. The American Society of Landscape Architects (ASLA) constructed a green roof on their headquarters building in Washington DC. The green roof is as much as 32˚ F cooler than conventional black roofs (ASLA, 2007). This difference was even more dramatic in a second study in Texas that found that green roof membranes were 100˚ F cooler on average than conventional black roofs on hot summer days (Simmons, 2008). 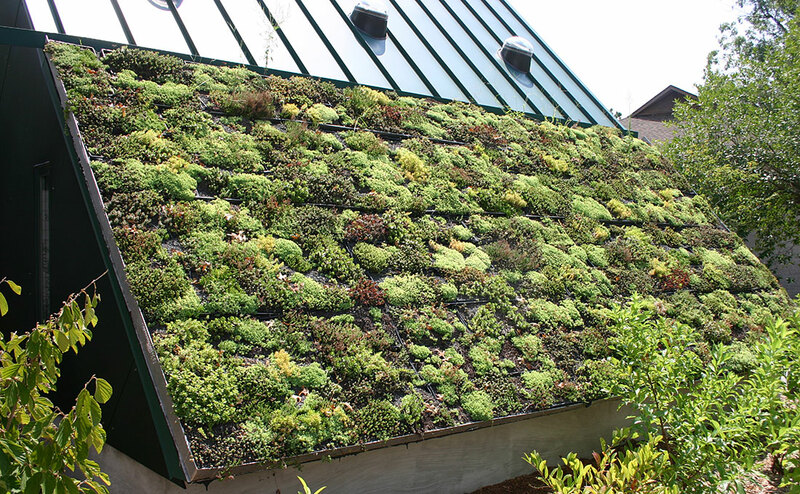 Generally green roofs provide a 15 to 25 percent energy savings in energy cost. 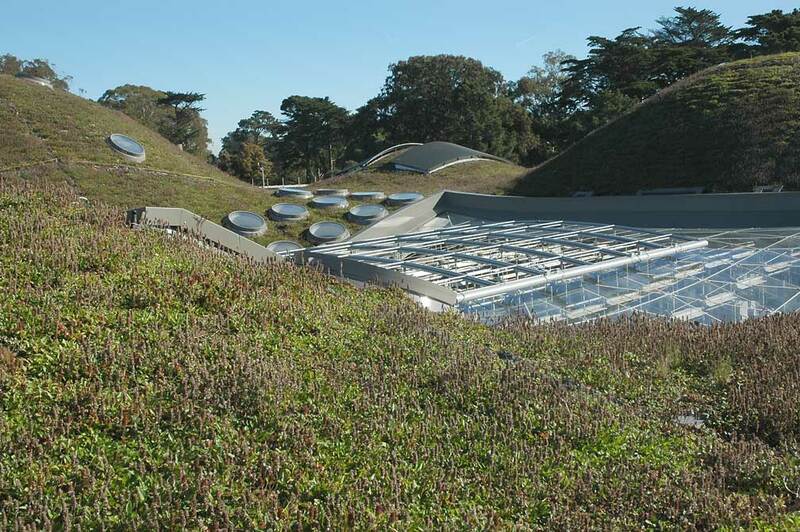 The heating and cooling requirements of the Academy of Sciences building are reduced 35% by its green roof. Energy cost saving due to the green roof on the Chicago City Hall is $3,600 per year (EPA, 2008). Traffic, smog, and dust are disagreeable aspects of the urban environment. The urban environment benefits every time a landscape is introduced. Rooftop gardens can help maintain air quality and help moderate the climate of urban areas. Carbon dioxide emissions are decreased since heating and cooling energy demands are reduced. Green roofs can mitigate the heat island effect. Cities have a higher average temperature (12¼˚ F in the day, 5¼˚ F at night) than in the outlying areas because of roof and paving surfaces that capture and radiate heat. Stormwater attenuation is another benefit of green roofs especially in the many cities that have combined sanitary and storm sewer piping. In this tutorial we will concentrate on the stormwater management and treatment capacities of the various types of green roofs. 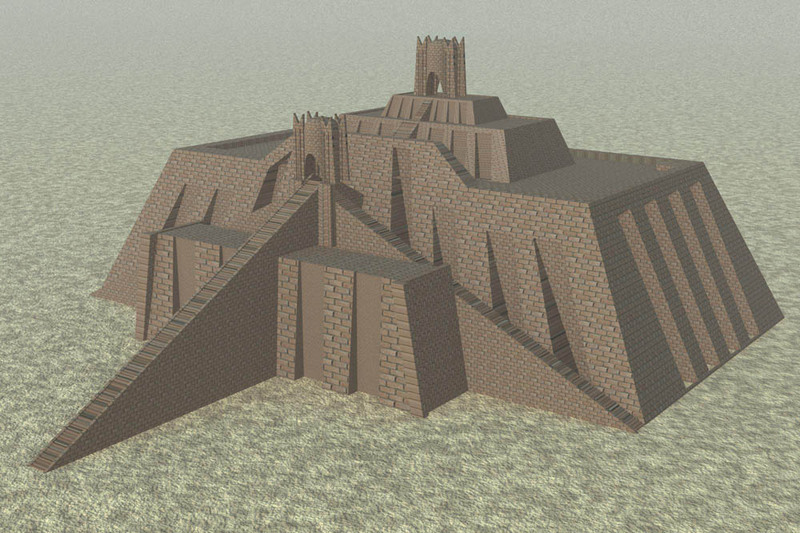 The first roof gardens were located on the famous Ziggurats of Mesopotamia during the fourth Millennium to 600 B.C. Trees planted on terraces helped create a cooler micro-climate in the desert region. 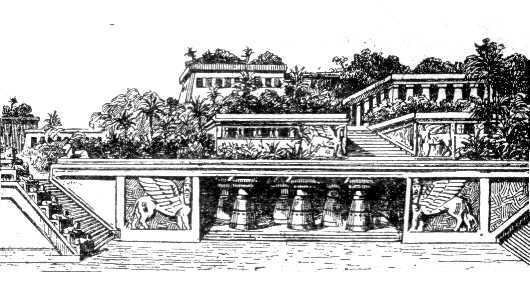 Perhaps the most famous of all rooftop gardens, the Hanging Gardens of Babylon, built by Nebuchadnezzar II (605-562 B.C. ), were one of the seven wonders of the ancient world. According to legend, Nebuchadnezzar's wife, Amytis, missed the lush greenery of her homeland so he built her gardens on the roofs of his palace. We know of these gardens from ancient texts, such as the Babyloniaka, written about 200 years after the gardens were destroyed. The accounts of the Hanging Gardens of Babylon describe stone terraces with the soil supported by colonnades and arches or vaulted ceilings. The waterproofing of the terraces was made from a layer of reeds set in thick tar covered by two courses of clay brick bonded with cement. 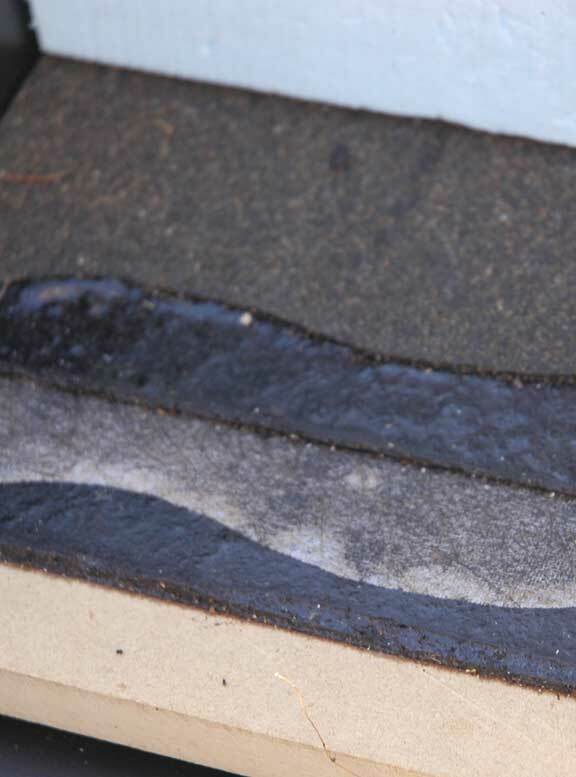 This base was covered by a layer of lead which acted as a second waterproof membrane. The drawings above depict research and artist's speculation about the form of the ancient hanging gardens. The section drawing is based on a description by Robert Koldewey. 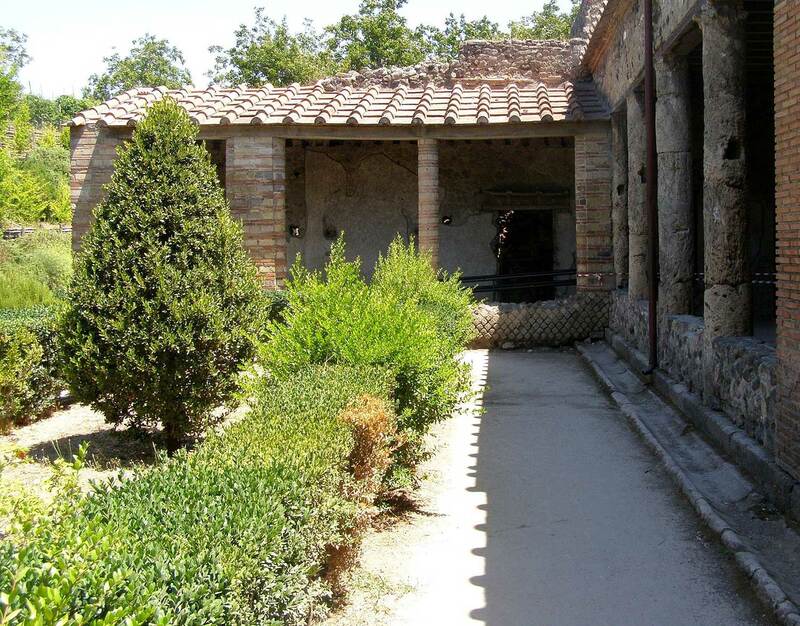 The Romans also created rooftop gardens, as seen by the Villa of Mysteries in Pompeii. Ash from the eruption of Mount Vesuvius preserved this large residence in Pompeii where terraces were planted with trees and shrubs. Careful excavation and restoration techniques has led researchers to identify some of the plants used in the garden. 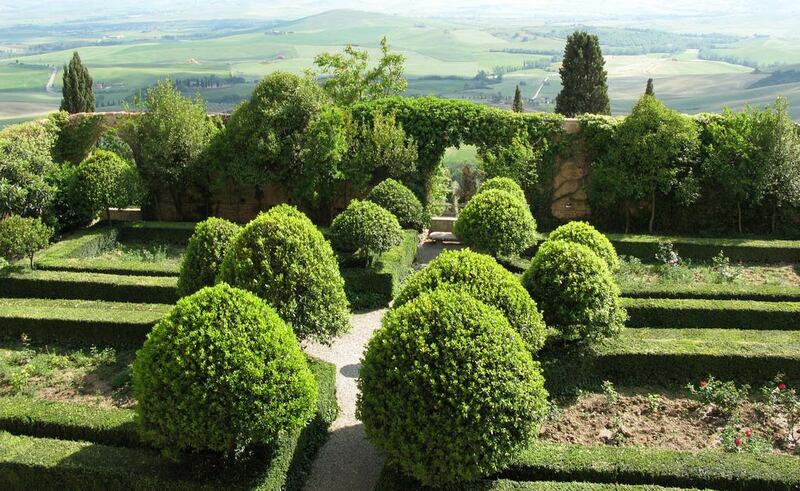 Italy has always been popular for its historical gardens and included in their history are various rooftop gardens. The Palazzo Piccolomini, the Tower of the Guinigis, and the Medici Roof Garden are all examples of Italian residences where terraces and gardens were placed on the roofs of buildings. These gardens preserved views into the countryside and urban areas and used the axial organization often seen in Italian garden architecture. The Mont-Saint-Michel in France houses a roof garden atop the cloister. Roof gardens dominated buildings in Germany and Russia from the 1600's to 1875. The gardens featured an abundance of trees and shrubbery which hung over walls and provided interior gardens. They Hermitage roof garden (shown above) was designed by the Italian architect Bartolemo Francesco Rasrelli for Russian czarina Catherine II. 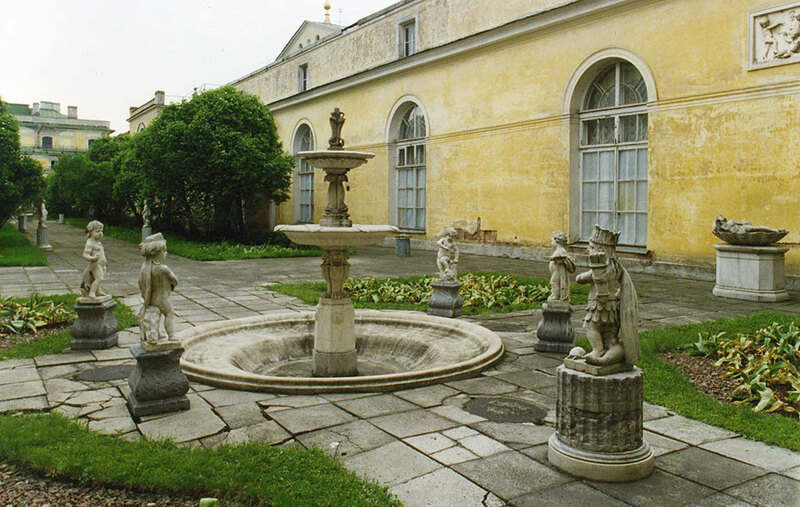 Formal parterres and garden spaces at the Hermitage accentuate the outdoor space and make the art museum an indoor/outdoor experience. The hermitage located in Saint Petersburg used lead sheets for waterproofing. 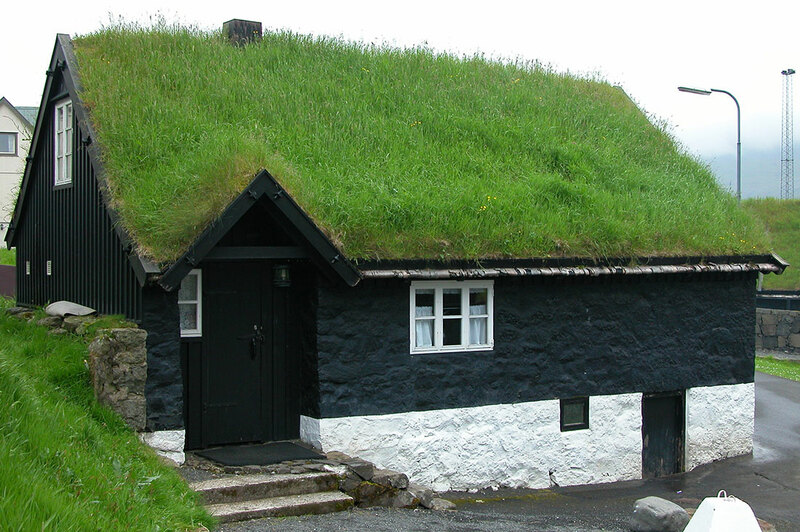 Germans and Norwegians were among the first to discover using plants and soil on the roof as insulation. This decreased temperature extremes allowing inhabitants to expend less energy on heating and cooling. Grass and flowers grown on the roofs proved to be both functional and ornamental. Sod houses like these were common in Germany and Norway during the 19th century. Theater roof gardens in the United States between 1900 and WWII were popular, allowing plays and public entertainment to be held outside on hot summer nights. Large seating areas and stages were placed on the rooftop. Small trees, shrubs, and flowers were planted at the edges of the building in containers or small beds. After seeing these expansive and accommodating gardens on top of many New York theaters, New York Hotels and apartment residents caught the roof garden fever and created their own terraces featuring Italian pergolas, Venetian arbors, wisteria groves, and flowering alles. Lighting was abundant so users could enjoy the space on warm summer evenings. 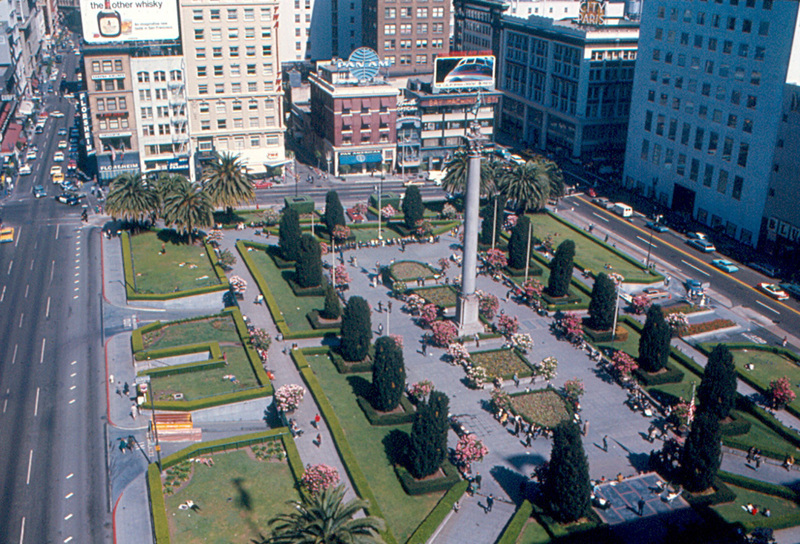 Left: Union Square in San Fransisco was built in the early 1940's. It led the revolution of underground parking garage and ground-level rooftop plazas in the US. Right: Union Square was recently rebuilt to accommodate contemporary uses. Several gardens built before WWII were pioneers in the roof garden industry and have led to the construction of many of those seen in urban areas today. 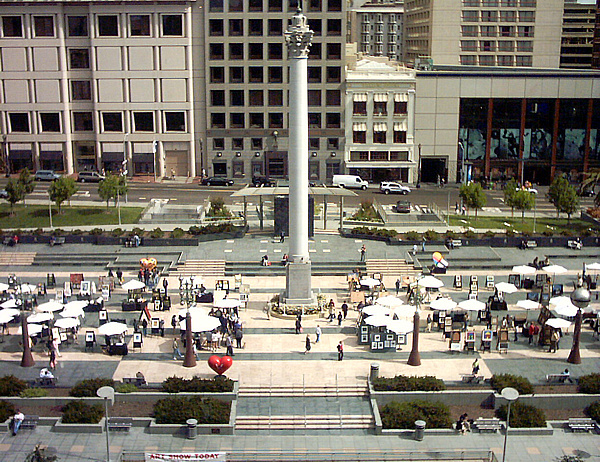 Union Square in San Francisco is an at-grade city plaza located on top of a parking garage. It is in the center of the downtown shopping district and enjoyed by thousands of people each day. It serves as an early example of parking garage rooftops. Those to follow it were Mellon Square in Pittsburgh, the Kaiser Center in Oakland, and many others. 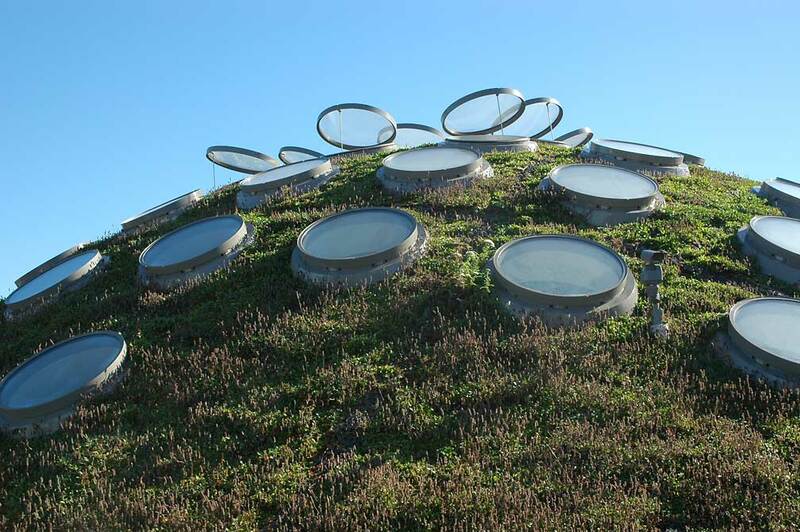 Modern gardens like the Kaiser roof garden in Oakland, California use lightweight materials for the roof structure and soil media. Advancements in structural roof design increased the potential load bearing capacity and led to the possibility of numerous landscape materials that were considered too heavy in the past. Modern green roofs are designated as either extensive or intensive. The extensive roof features a thin growing medium while the intensive roof requires a stronger roof to support deeper soils, larger plants and the weight of people and associated amenities. Extensive roofs are low-maintenance systems that provide economic and environmental benefits on either flat or sloping roofs. The most important aspects of extensive roofs are stormwater management, pollution abatement, reduced heat island effect and temperature control for the building. This section will present research that demonstrates the performance of extensive roofs in each of these areas. Soil depths are generally 3" for extensive roofs and access is limited to maintenance people. Extensive green roofs require a structural capacity of at least 25 pounds per square foot, but 35 pounds is preferred. Typically, a 1 inch depth of wet soil media weighs about 7.5 pounds per square foot. Therefore, a three inch depth equals 22.5 pounds per square foot (Penn State). 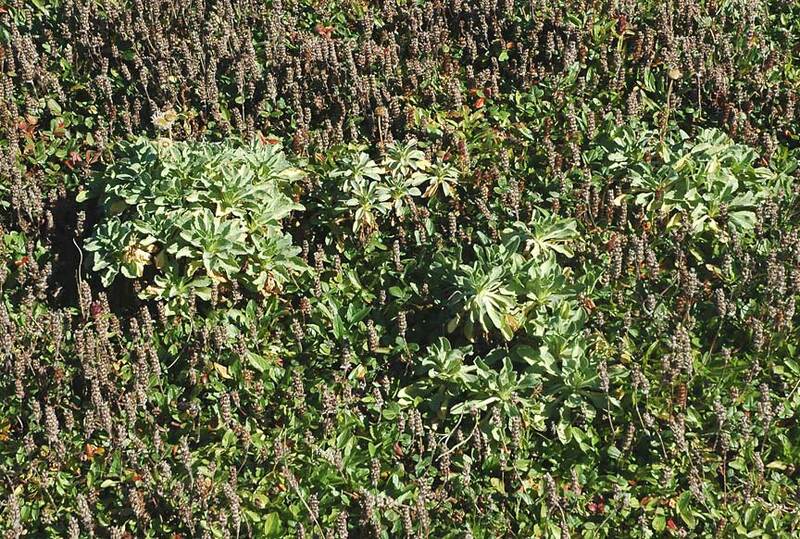 Only a limited number of plant species can flourish under the harsh conditions presented by the rooftop location and the minimum soil, especially if supplemental irrigation is not provided. 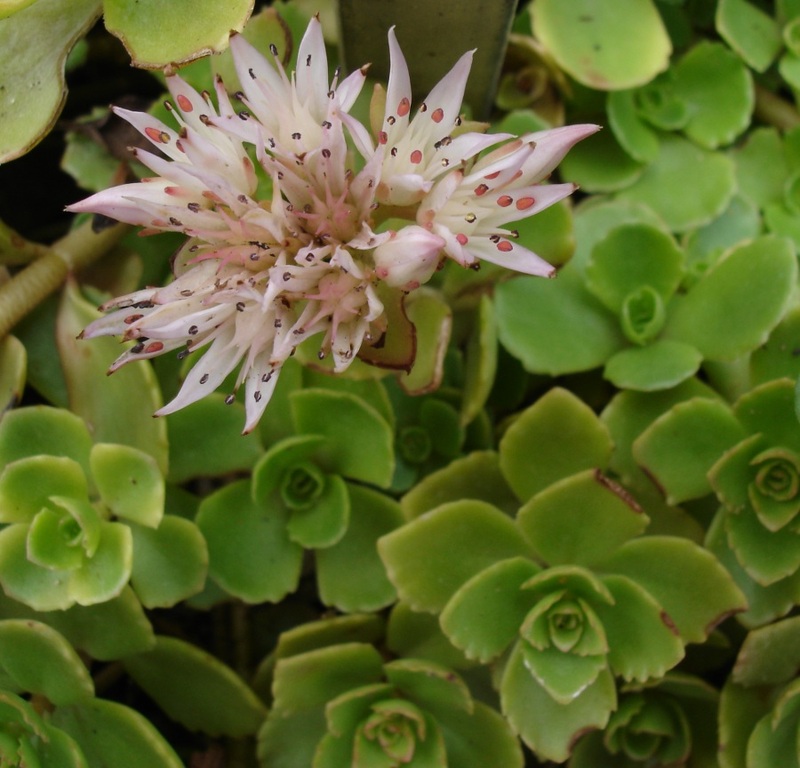 A few species of sedum are typically specified, as illustrated in the image above. However, in regions with ample precipitation well distributed throughout the year, the planting palette expands somewhat. Here the topic of stormwater management rather than water quality performance is presented. The stormwater runoff benefits of extensive green roof is influenced by the regional characteristics of the rainfall and the extent of winter freezing temperatures. The retention of rainwater is also influenced by how quickly water is evaporated and transpired from the soil. Therefore, runoff performance is better in summer than in winter. In regions where there is little summer precipitation but a large amount of rain or snow during cold winters, green roofs will be less valuable for runoff control. Extensive roofs can retain about 0.3" of rainfall per inch of soil (Penn State). Therefore, they perform better in regions characterized by small storms, especially if they are spaced apart over time. Understanding these limitations, research was conducted on four extensive green roofs in Auckland, New Zealand where there is an average annual rainfall of almost 48" and where the rain is well distributed throughout the year. The study demonstrated that annually up to 56% of the cumulative stormwater was captured and then evaporated or transpired. For these roofs the soils were 80% light-weight aggregate and 20% organic material supporting Sedum species and native plants (Fassman-Beck, 2013). Another recent study found that an extensive roof with a 4" soil depth reduced runoff by an average of 45% (Mentens, 2006). Using TR-55 to estimate the runoff from green roofs is problematic because TR-55 is a single-event calculation and assumes a certain amount of infiltration which doesn't exist for roof gardens. Nevertheless, a 2007 study, developed a runoff curve number for an extensive green roof for use in TR-55 calculations. The green roof used to establish the curve number was composed of a 3” deep soil (55% expanded slate, 30% sand, and 15% organic matter). The soil had a total porosity of 50.6%. The site was in Athens, Georgia (annual rainfall of 48.5 inches). The resulting curve number was 86 (compared to 98 for an impervious roof). This number applies to a warm, humid climate with a Type II storm. The state of Maryland suggests a range of 60 to 90 for extensive green roof CN values depending on the design storm being analyzed. Lower values would be for small storms. The county of Fairfax,Virgina suggests a CN of 70 for extensive green roofs (http://www.estormwater.com/air). 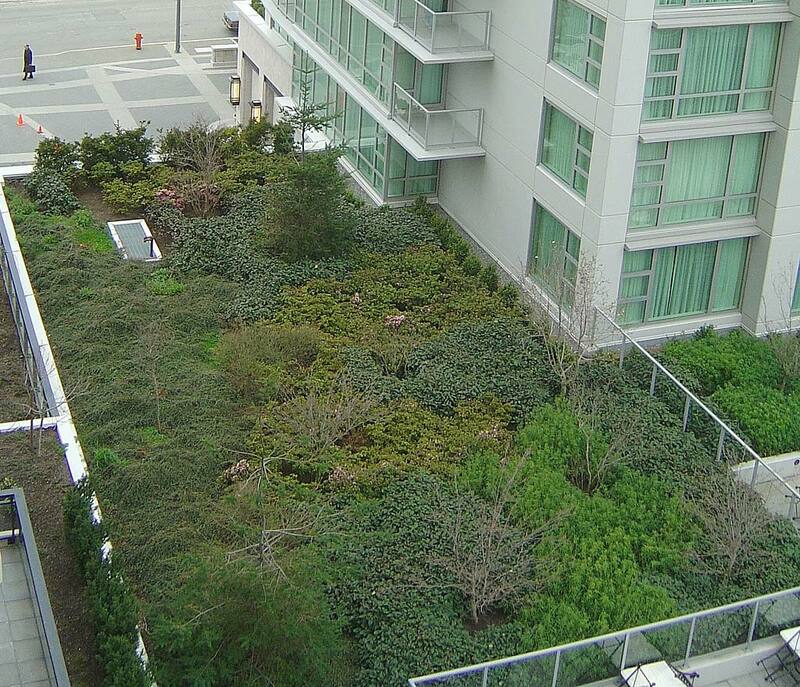 A study in Vancouver, BC directly measured the runoff from two green roofs directly and found that the annual runoff reduction was only 21%-24%. This lower value (compared to the Auckland study discussed above) is due to the way that precipitation is distributed during the year. 85% of the precipitation falls between mid-October and mid-April and the stormwater retention during this period is very low due to limited evaporation and frequent precipitation (Roeht, 2010). When	calculating composite curve numbers for your Moscow project a CN of 86 or 87 seems to best represent the research data for the 2-year, 24-hour storm when using TR-55. The use of a drain mat that stores water improves the stormwater runoff performance of green roofs, as you will see in the case study below. However, it also adds weight to the roof. Because green roof soils are highly permeable, they have a small effect of reducing or delaying the storm peak. 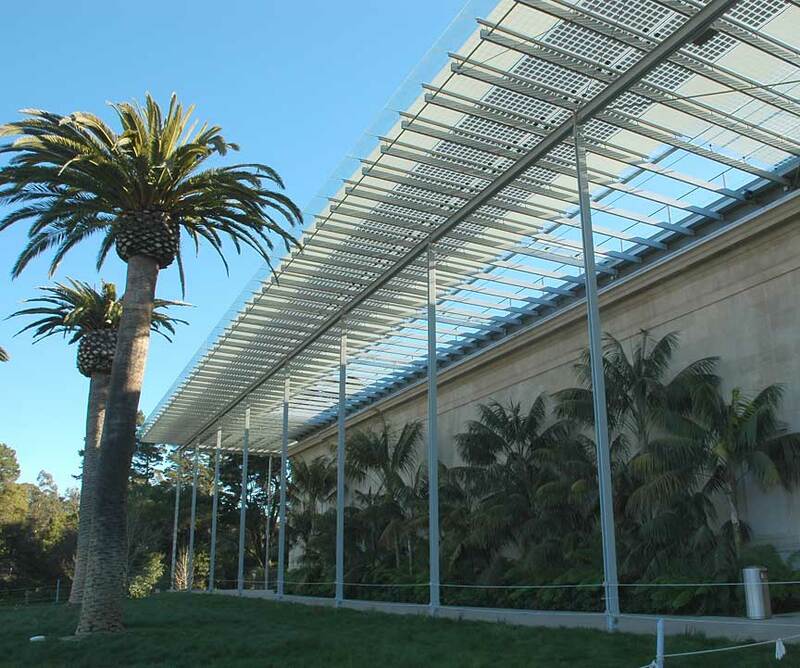 The Academy of Sciences building in San Francisco was designed by Italian architect Renzo Piano. Completed in 2008 the building achieved a Gold LEED rating and features a 2 1/2 acre green roof. Enlarge the first image to see the new building with its distinctive domes in the background. This is a roof that is primarily extensive although there is a small observation deck and interpretive area. However, the total soil depth is about 6", which is twice the depth of most extensive green roofs. Sixty thousand photo-voltaic cells (PV) that are 18% efficient are integrated into the glass roof along the front of the building. The cells supply a portion of the buildings energy that would otherwise release of more than 22.5 tons of greenhouse gas annually. The cells produce 250,000 kilowatt hours of electricity per year. 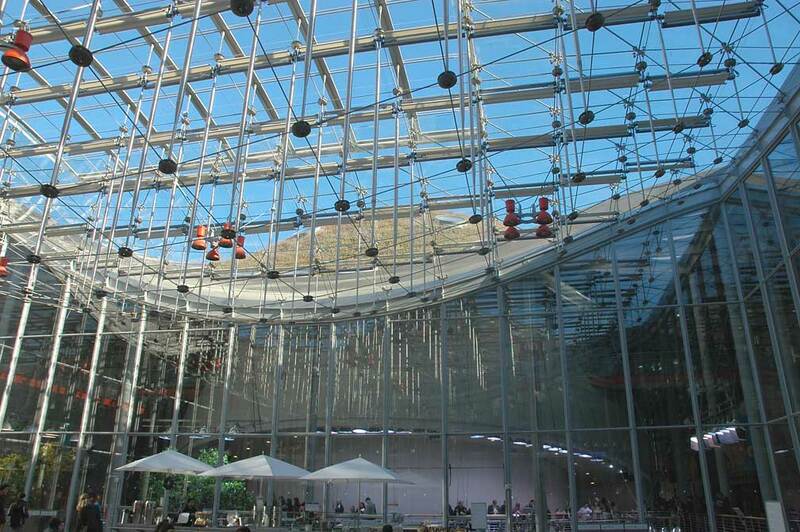 The glass canopy also cools the building in summer by preventing direct sunlight from entering the building while permitting it in the winter. The first image above shows the canopy at the building edge while the second shows it from above. 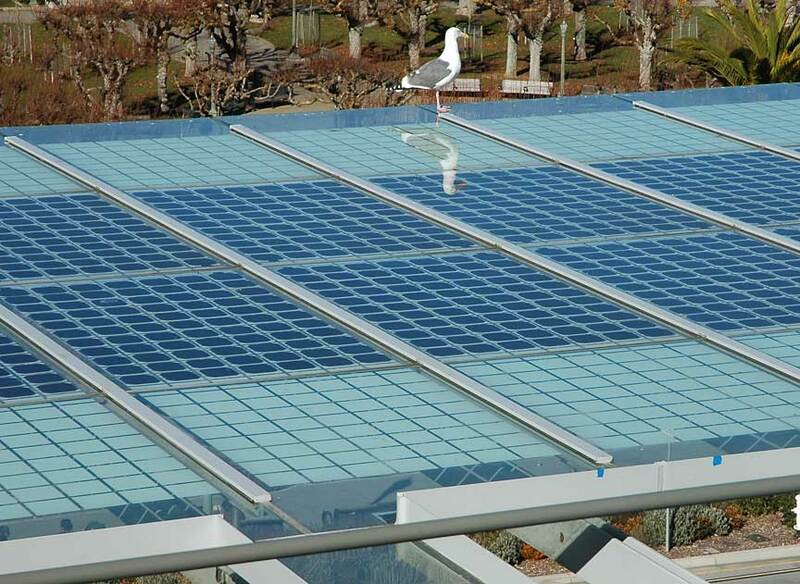 The PV cells are well integrated into the canopy. The roof contains skylights over a dining terrace (first image) and other sections of the building. The second image shows that the skylights open to vent excess heat from the building. Weather stations on the roof provide data to automatically open and close the skylights depending on the environmental conditions. Enlarge the first image to see the roof waterproofing system. The wood border on the bottom of the stack represents the 6" to 8" thick, concrete roof. 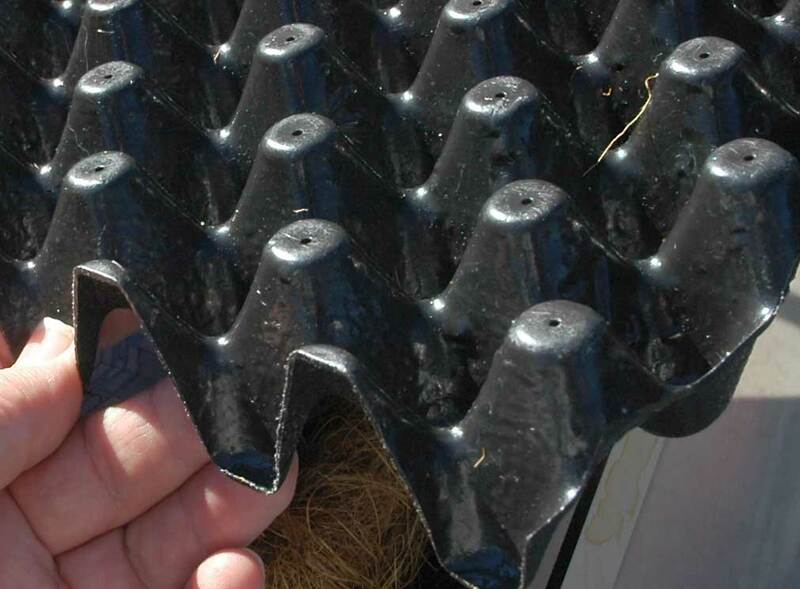 Notice that there are four layers of roofing fabrics and membranes. The second image shows the next layers of the green roof. The light blue material is rigid foam insulation that protects the roof membranes and insulates the roof. The next layer is a thin waterproof membrane then a corrugated polypropylene drain mat. 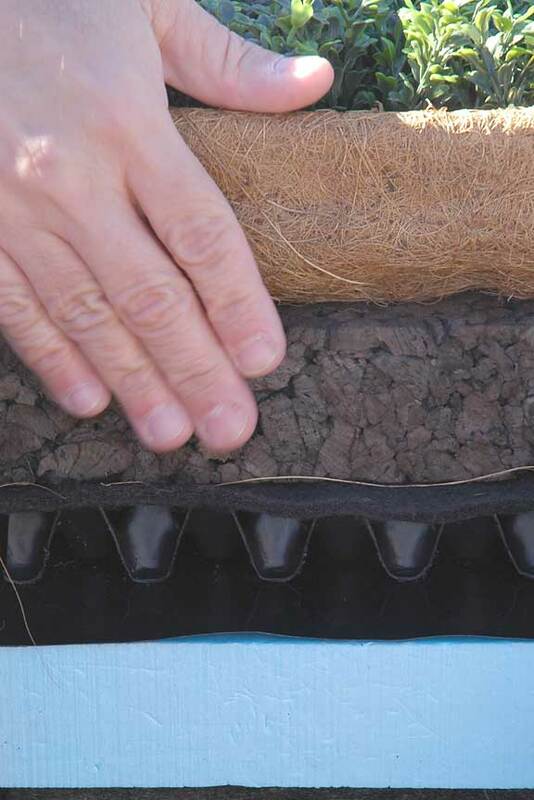 Next is a filter fabric that separates the soil (represented by the brown cork) from the drain mat. At the top of the stack is a coconut fiber tray that holds more soil and the plants. The last image is a close-up of the drain mat. Enlarge the image so that you can see holes in the top of the egg crate-like mat. This is the overflow outlet. This means that after a rain storm about 1 1/2 inches of water is held in the tray for later use by the plants. The green roof is composed 50,000 trays made of coconut fiber over a thin wood frame. The trays were necessary because the slope on the dome sections were so steep. The fiber will decompose within about five years, but by then the plant roots will have knitted the soil together to control soil erosion and stabilize the slope. 35 plants were tested and of these 9 were selected as the main palette for the green roof. The following 9 plants cover 90% of the roof are best adapted to the climate and roof top setting. 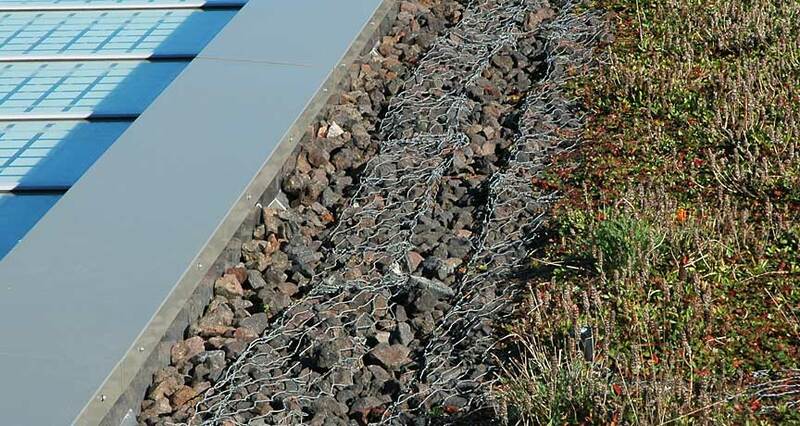 These two images show gabions. These are rock filled wire cages that are arranged in a grid across the roof. Their primary purpose is to drain excess water from the roof but they also serve as roof access walkways for gardeners who need to tend to the plants and irrigation system. The roof provides benefits beyond energy conservation. 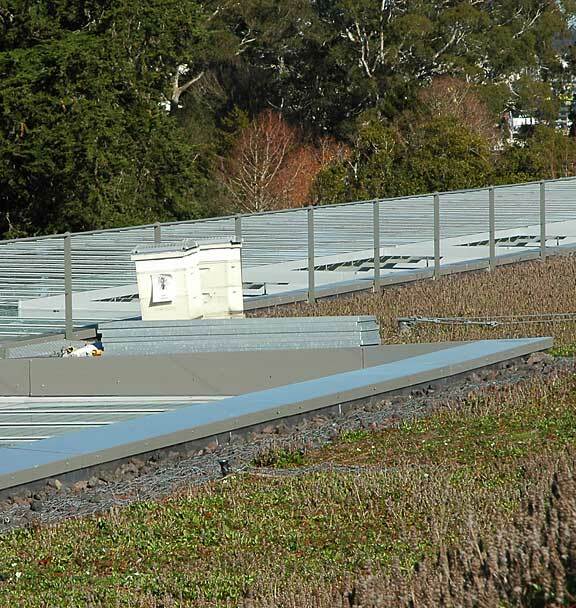 The 2 1/2 acre green roof is the largest patch of native herbaceous vegetation in the city of San Francisco and provides habitat for insects and birds. In fact, there are two rooftop locations for honey bee hives. You can see one in the first image above. 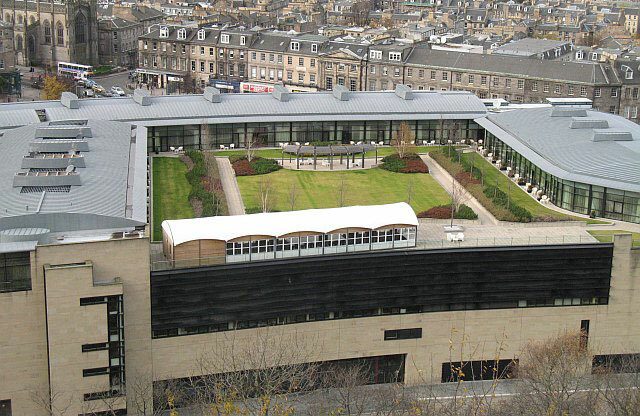 Green roofs can be designed to contain many micro-habitats to foster biodiversity. A green roof of this type in Germany supports a total of 119 species of beetles and spiders, 20 of which are endangered. The Academy of Sciences roof hosts birds, bees and other pollinators including a threatened butterfly (the bay checkerspot) use this habitat fragment (Aleta, 2008). The roof includes a honeybee hive in two rooftop locations. The technology, energy and ecological benefits provide an excellent opportunity for interpretation. 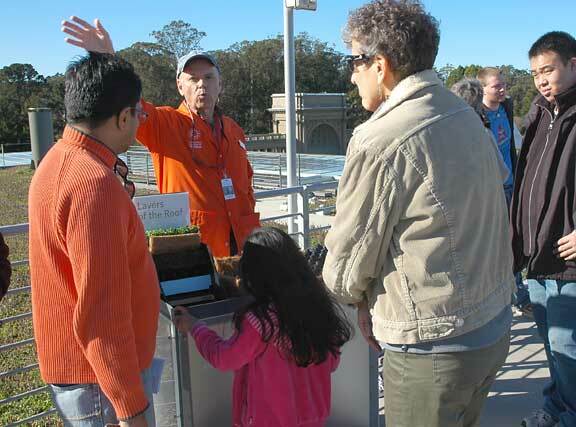 In the second image you can see a staff docent explaining the features of the green roof to a family. The last image shows the dinning terrace and its glass roof. The roof combines daylighting, stormwater, education, habitat and energy saving benefits. This multi-functional approach is necessary to justify the substantial cost of implementing a green roof. Landscaped roofs present plants with a set of very difficult growing conditions. Green roof plants are exposed to high wind velocities and maximum solar radiation. If the roofs slope steeply, the water runs off more quickly increasing drought stress. Finally, the limited soil depth on extensive green roofs and its lightweight character reduce the water holding capacity. 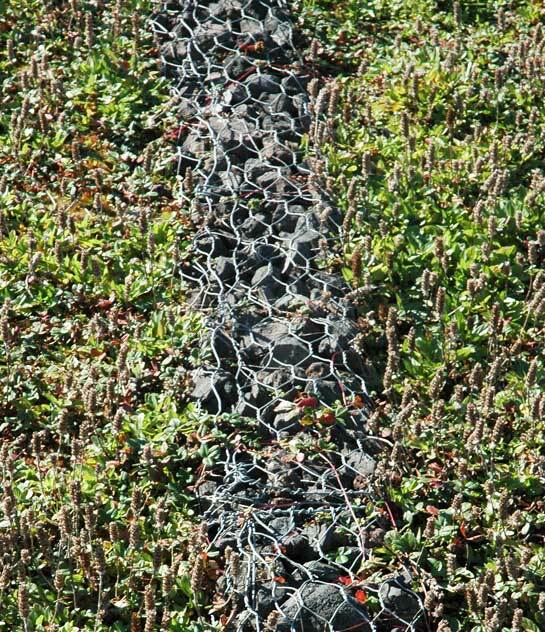 Sedum species are widely used to vegetate green roofs since they are hardy and tolerate drought conditions. 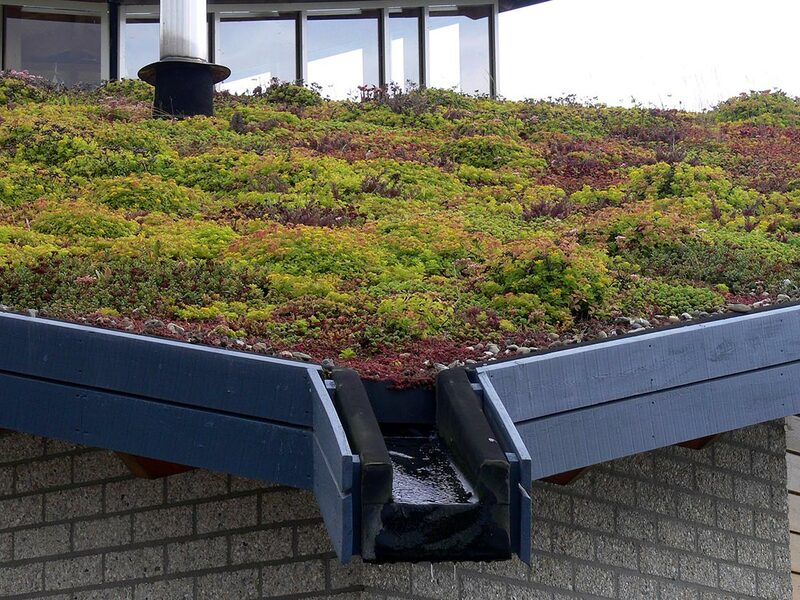 Species effective on extensive roofs include Sedum album, S. reflexum, S. spurium (see image above), and S. sexangulare, but many other native and non-native species are suitable. Intensive green roofs are complete landscapes or gardens. Since people and a wide range of landscape elements are required for this type of garden, steel and concrete buildings are best suited for intensive rooftop gardens because they can be designed to support 250 to 300 pounds per square foot of weight, although often much less capacity is needed. The soil depth on intensive roofs varies and may be limited by the structural capacity of the roof. Of course, the depth and weight of the soil and plants must be calculated to meet the structural design. Suggested soil depths are suggested below. Some plants like sedum can sustain themselves with depths more shallow that noted below. Light weight soil mixes have been developed and are applicable to intensive and especially to extensive roofs. Initially these contained about 25% top soil, 40-50% sand, and the remainder as peat moss, sphagnum moss, or vermiculite. More recently expanded clay and expanded shale have been the primary component of the planting media. These are inert so fertilizer and soil supplements are added to sustain the plants. Acros building roof garden, Fukuoka, Japan. Designed by Emilio Ambas. Photo: Kenta Mabuchi CC 2.0. Many more plant choices are available for intensive roofs since the soil is deeper, but Rhus copallina (Flame Sumac), Rhus aromatica (Smooth Sumac), Campsis radicans (Trumpet Vine), Eragrostis spectabilis (Purple Lovegrass), Allium ceruum (Nodding Onion), Coreposis verticillata (Thread Leaved Tick Seed), Asclepia tuberose (Butterfly Milkweed) and Rosa Carolina (Pasture Rose) perform well (ASLA, 2007). The testing and use of native plants is valuable for better habitat value. A Canadian study successfully cultivated ten native plants that performed as well or better than the standard Sedums for various green roof functions, such as temperature and albedo (MacIvor, 2011). The plant list below features common landscape ornamental plants that are suitable for intensive roofs if their water and sun requirements can be met. Weight limits on most roofs stipulates small trees should be no more than 10-15 feet high and tall trees should not exceed 25 feet. 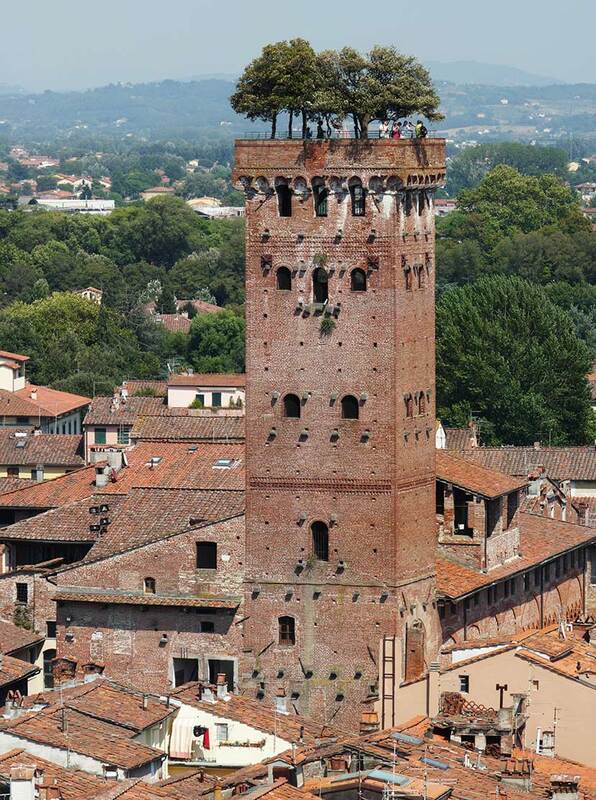 Even with these limitation tree may have to be located above structural columns. How much cooler is the ASLA green roof than conventional black roofs? What is the cause of the heat island effect in cities? What is the typical soil depth for an extensive roof? How much does a 3 inch depth of wet soil media weigh? Extensive roofs can retain about ________" of rainfall per inch of soil. The research of stormwater capture on extensive roofs in Auckland, New Zealand found that _______% of the total amount of rainfall was captured and evaporated or transpired. How many inches of water does the drain mat on the Academy of Sciences green roof hold? How many pounds per square foot of weight is typical for intensive green roofs? What light weight material is specified for contemporary green roof soil? What material is used as a substrate below soil in tall planters or berms on green roofs? Name one plant recommended by ASLA for use on intensive roofs. G. R. Aleta, “Greening a Higher Ground,” Smithsonian, vol. 39, no. 8, 2008. Allen, Edward. Fundamentals of Building Construction: Materials and Methods. New York: John Wiley and Sones, 1985. American Society of Landscape Architects, “ASLA Green Roof Monitoring Results,” Washington, D.C., 2007. Bowen, Bob. "Building Rooftop Gardens." Updated 5, May 2001. <http://www.manythings.org/voa/01/010605ar_t.htm>. Cited 26, Oct. 2001. T. Carter and C. R. Jackson, “Vegetated Roofs for Stormwater Management at Multiple Spatial Scales,” Landscape and Urban Planning, vol. 80, no. 1–2, pp. 84–94, 2007. Environmental News Network (ENN) staff. "Green rooftop technology saves energy, cools air." Updated 1, Jan. 2001. <http://www.cnn.com/2001/NATURE/01/01/rooftop.gardens.enn/>. Cited 26, Oct. 2001. EPA, “Reducing Urban Heat Islands: Compendium of Strategies,” U.S. Environmental Protection Agency, 2008. E. Fassman-Beck, E. Voyde, R. Simcock, and Y. S. Hong, “4 Living Roofs in 3 Locations: Does Configuration Affect Runoff Mitigation?,” Journal of Hydrology, Mar. 2013. 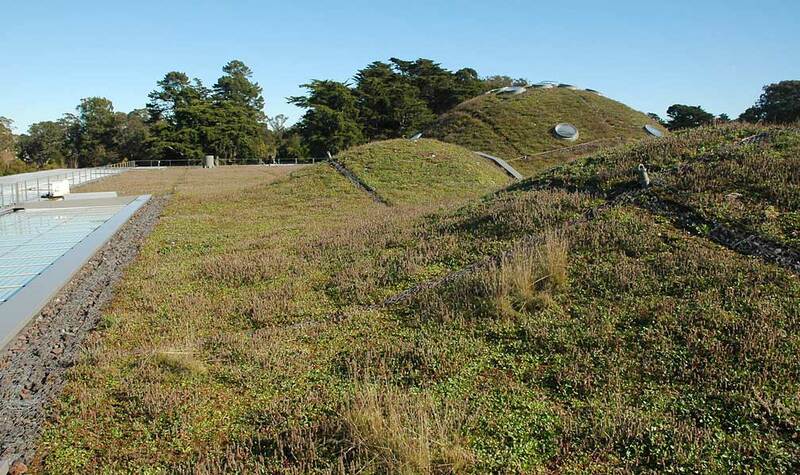 J. S. MacIvor and J. Lundholm, “Performance Evaluation of Native Plants Suited to Extensive Green Roof Conditions in a Maritime Climate,” Ecological Engineering, vol. 37, no. 3, pp. 407–417, Mar. 2011. Penn State Center for Green Roof Research, “Green Roof Brochure,” Pennsylvania State University, No date.